Many students I work with believe that more distance off the tee will significantly lower their scores. Typically the best way to lower scores would be to work on shots around and on the green; however more distance is never a bad thing. If you would like more distance here are a few tips for your set-up and swing with the driver to improve contact, which in turn will increase distance. The fact that the driver has the least amount of loft and is longer than any other club can make it the most difficult club to hit. Some of the most common “miss-hits” with the driver I see are pop-ups, topped shots, and slices. These problems are typically caused by a steep golf swing where the driver head is moving at a descending angle into the ball. The goal would be to sweep the ball off the tee at an ascending angle into the ball to achieve the best launch angle and to minimize the backspin of the ball while it flies in the air. This goal can be achieved by paying attention to ball placement and also the turn you make during your backswing. To check your set-up to the ball, look at your reflection straight on in a full length mirror or sliding glass door as you take your grip, stance, and posture. This would look similar to the picture of my set up to the ball with my driver (I have flipped the image to match the reflection of a right handed player). Make sure that your ball placement is off the inside of your left heel and that the outside of your left shoulder is behind the ball. 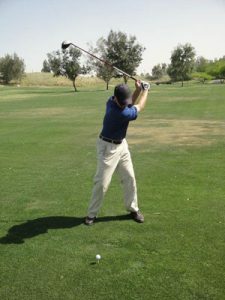 Then turn your shoulders to the top of your backswing and make sure it looks like mine with your left shoulder turning under your chin and over the instep of your right foot. You will notice that your back is turned toward the target. 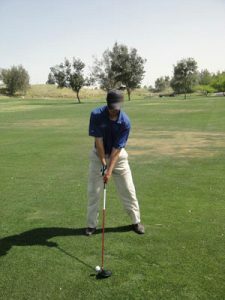 This ensures that you are far enough behind the golf ball at the top of the backswing with your upper body in order to give yourself time to unwind and sweep the ball off the tee. You can practice this anywhere to promote a proper set-up and backswing to maximize your distance off the tee.